I’ve been following Randy King’s Rants for about two years now. He along with Kasey Keckeisen have been building upon the personal protection material that started with Rory Miller and Marc MacYoung. One of those rants was “Stop Practicing Dying“. This rant finally gave words to the concept that I’ve been taught since starting my martial arts training. As I prepared for my first colored belt test in Taekwondo (way back in 1981), I was told that if I made a mistake don’t stop. The reason given at that time, which is still true but there’s more to it, was that continuing shows your discipline and control. 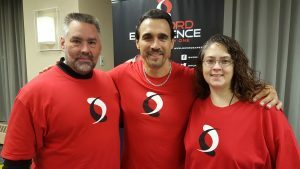 Having the chance to work with Adrian Paul and his Sword Experience seminar was a blast AND educational. Doing things the “Hollywood” way taught much but the opportunity to chat with him about martial arts training brought even more insights. He gave me some additional “words” to describe things I already present. I may be better able to get students to understand where I’m trying to lead them now. Part of enjoying the work with him was hearing him comment that there is WAY too much “attacking the blade” movements done in sword fight scenes. If the technique isn’t actually aimed at a target, it won’t look real. Another statement that he made was… You can have as much violence within your movements as you wish, as long as you stay in control. This last thought was illustrated during our “takes” doing the scene. The video below picks up part way through our first take. The second take was fun but the third take shows the reason for control. As we get to the last move, Adrian misses the cut and we end up in a non-rehearsed place. His control allows him to find another technique that is still in control so neither of us gets hurt. Making sure that you don’t practice dying is even within the training of Hollywood actors! I am very grateful to have had the opportunity to help Adrian Paul with this seminar and hope to get the chance to assist again during a Twin Cities seminar.